COMMENT: No one's had more from the EU than the Irish. So why have so many of them turned against Brussels? For decades, Ireland has benefited from the largesse of European taxpayers. Even Eurosceptics admit that the EU has been crucial in Ireland's transformation from a relatively small country dependent overwhelmingly on trade with its former ruler Britain into a wealthy modern state that can compete on the world stage. Why then might this country, which is popularly regarded as the economic miracle of the EU, vote against the Lisbon Treaty today - even though all the major political parties want it to vote Yes? Essentially, the Irish are veering towards No for two reasons: they don't trust their own politicians, and they feel Brussels has got too big for its boots. They changed their prime minister recently and haven't really taken to the new man, Brian Cowen, the former finance minister who succeeded the well-liked if rather dodgy charmer Bertie Ahern. Cowen and the uncharismatic leaders of the other major political parties are poor salesmen whose absence of substantial arguments have exposed the vacuity of the pro-Treaty case. There are No voters who don't care one way or the other about the EU but who just want to give the government a bloody nose. But there are many more who were once Euro-enthusiasts but are increasingly worried that unelected bureaucrats are stealthily grabbing power that should remain with nation states. It is an appalling reflection on the EU that Ireland is the only country putting the Treaty to the electorate and that it is doing so only because this is a constitutional requirement. The fact is that, of the half-a-billion or so European citizens who will be affected if the Treaty goes through, only one in 100 - the Irish - have the right to vote on it. Many Irish citizens realise this is an awesome responsibility and a referendum that really matters. They know perfectly well that their political leaders are furious that they could not avoid the constitutional requirement to have a vote because they are terrified of losing it. They know, too, that the eyes of the European political establishment are on them. Bernard Kouchner, the French foreign minister, is the latest outsider to attempt to bully the electorate. A No vote would be greeted with 'gigantic incomprehension', he said. Such interventions have served only to boost the No campaign. Another factor that has helped the No cause is the deeply unimpressive admission of the Irish PM that he hasn't even read the Treaty. It is true that most of those who have tried to read the 287-page document have given up because it is so impenetrable. But an ever-growing section of opinion is now saying firmly that only mugs sign up to anything they don't understand. In fact, some polls suggest that the single biggest reason for voting No is that people do not know what effect the Treaty might have on them. The lamp-posts of Dublin are festooned with posters. Those from the Yes side feature photographs of prominent politicians with bland messages like 'Good for Ireland and Good for Europe'. 'Trust us' is the theme. But many voters believe they are being bamboozled. It is striking that the No campaign is bewilderingly varied so often contradictory - with various factions, for example, attacking the Treaty simultaneously for being socialist and capitalist, or both too pro and too anti union rights. This is proof positive that no one really understands what the Treaty entails. Sinn Fein, the political wing of the IRA, denounces it as militaristic and the pro-lifers think it's a gateway to abortion, which at present is outlawed in Ireland unless the mother's life is in danger. And although the Irish are well aware that a nation with a history of large-scale emigration should be hospitable, voters see the Treaty as opening the floodgates to migrants. Over the past four or five years there has been a massive increase in foreign job-seekers and, as the credit crunch hits, the pressure on public services caused by Poles, Lithuanians and all manner of other European citizens is causing tension. Then there's the perception that Brussels is corrupt and corrupting. Irish voters who follow British politics are watching with interest the sleaze allegations about greedy MEPs which are presently embarrassing the Tories and will shortly be troubling Labour and the Lib Dems. Traditionally, financial chicanery was tolerated in Ireland, but revelations about Bertie Ahern's mystifying acquisition of thousands of pounds when he was in government are damaging all politicians despite Mr Ahern's denials of any wrongdoing. Many informed observers would nowadays assume that when it comes to the EU gravy train, Irish MEPs will be helping themselves with extra-large ladles. Most important, even though the Irish have historically been Europhiles, there is a widespread unease about any further erosion of sovereignty. Many voters see all too clearly the irony of their leading politicians telling them to put their faith in the unelected bureaucrats of a profoundly antidemocratic Brussels. A letter to a newspaper this week pithily summed up the mystery and murkiness that surrounds the Treaty by pointing out concerns about how it would affect the rights to abortion. The correspondent said that Article 13 of the Charter of Fundamental Rights promised that 'scientific research shall be free of constraint', suggesting that it would authorise abortion in Ireland. That could have a profound change. While those people in Britain who expressed worries about the the possibility of legalising animal-human hybrids following the recent debate over the Human Fertilisation and Embryology Bill were offered some safeguards, there appear to be none for Irish pro-lifers. Indeed, the prospect of scientists being allowed to do whatever the hell they like is horrifying, and close scrutiny of any part of this Treaty reveals ambiguities and small print that should make anyone wary. Reassurances that new powers will be used sparingly and responsibly are worthless. EU legislation is now such a complex area that there is probably no one who fully understands it. As in Britain, where increasingly courts over-rule Parliament, Ireland is realising that it could, in future, be at the mercy of foreign judges. The voters in Ireland may not understand the Treaty, but they understand the erosion of sovereignty. 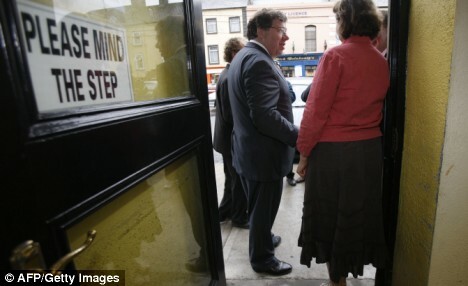 That is why Brian Cowen and his opposite numbers in the big parties have been reduced to begging the voters to say Yes. The feeling in the streets is that they are more likely to say No.